Published: April 07, 2019 15:27 Usman Ghafoor, Special to tabloid! Bushra Ansari never ceases to surprise us. 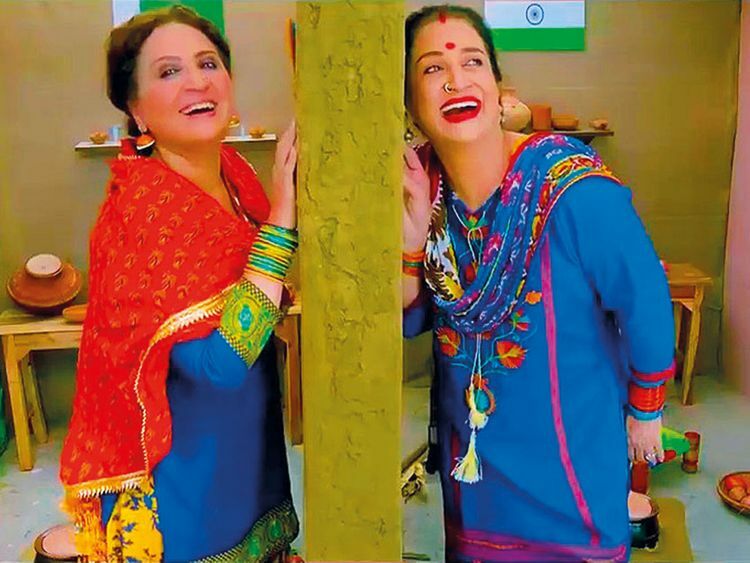 One of the most versatile actress Pakistan has ever seen — after all, who can recreate her multiple comic avatars in 1980s’ ‘Shosha’ and ‘Fifty Fifty’ and, decades later, the inimitable Saima Chaudhry from ‘Dolly Ki Ayegi Baraat’? Ansari has also diversified by singing semi-classical and regular songs, scripting TV plays that raise important questions about society and directing a host of them. Not to forget, she is a great mimicry artist. Her latest act is a delightful Punjabi video, titled ‘Hamsaye Maa Jaye’ (a neighbour who is more like a mother), featuring younger sister Asma Abbas as a simple, Pakistani woman in an ordinary household who identifies herself both culturally and emotionally with her counterpart (played by Ansari) across the border. They feel a natural connection between them, as they speak through the high fence (symbolic of the India-Pakistan border) that is topped with glass pieces. The two ladies are seen talking animatedly to each other — they address one other as “Gwandiye” (Punjabi for ‘dear neighbour’), and share their everyday thoughts in the simplest but most cogent way — from wondering what their homes look like, to lamenting the fact that there is poverty on both sides, to asking each other whether they should cook spinach or lentils. They are also reminded that the TV projects them as enemies. The tone of the video becomes morose, as the two ladies ruminate on the havoc a possible nuclear war could work in the region; it could destroy humanity from the face of the earth, they fear. The mood shifts back to fun, as the ladies promise to dump the “atom bombs” into the stove, and rise to dance in celebration of the fact. The lines, penned by Neelum Bashir, Ansari’s eldest sibling, make for a political satire that is evocative despite being simplistic. In a climactic moment that would melt the coldest of hearts, the two neighbours hug the wall that separates them. It shows how the common people in both India and Pakistan feel love for each other; and that they want to meet up and celebrate a shared history and culture. Perhaps, the most interesting part of the video is that the entire conversation is composed in a rap song, with some inspiration from the Punjabi folk traditions of ‘tappay’ and ‘boliyaan’. Directed by Iqbal Hussain, the video was recently released by Ansari on her official YouTube channel. It is shot on a single set but the video never loses fizz or become cumbersome, despite its strong message of cross-border bonhomie.